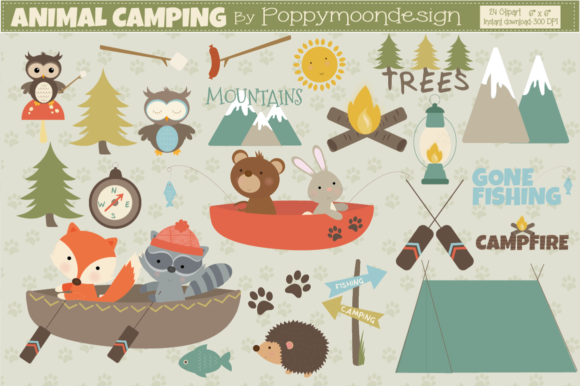 A cute animal camping clipart pack, using a fun nature color palette. With cute animals camping or fishing, tent, trees, mountains and more. Perfect for party invites, scrapbooking, greetings cards and all your camping themed crafting. This pack includes 24 clipart elements. Cliparts are file format PNG, approx size 6″ x 6″, saved on transparent backgrounds, 300dpi. Coordinating Animal camping papers can be downloaded separate.